For the second straight year, Waldorf’s Hattie Hupke and Kaylie Brindley earned the top honor handed out by the NAIA to student-athletes for their all-around performance, while the Warriors’ Madison Mason was recognized by the NAIA for the first time. 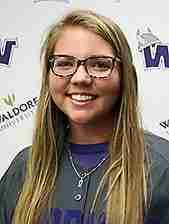 Wednesday the NAIA announced its Scholar-Athletes for softball, and Waldorf seniors Hupke and Brindley each were named Daktronics-NAIA Softball Scholar-Athletes for the second straight year, while Mason, a junior, was named a Daktronics-NAIA Softball Scholar-Athlete for the first time. To be eligible for the honor, a student-athlete must be a junior and in at least their second year competing for their institution. They also must maintain a cumulative 3.5 GPA, or higher, in all their collegiate work. Brindley is an Elementary Education major from Earlham, Iowa, who maintained a 3.91 GPA in her classwork. The Warrior pitcher won 11 games and struck out 59 opposing batters in 146 2/3 innings this spring. Hupke also is an Elementary Education major, from Carlisle, Iowa, who holds a 3.93 GPA in her college career. This season, Hupke led the Warriors with a .383 batting average and 44 runs scored in 43 games. She added in a home run, 23 RBIs and nine stolen bases, as well. Mason is a Business major from Hampton, Iowa, with a 3.84 GPA. She hit .296 with three home runs and 24 RBIs in 43 games for the Warriors this spring.